Spreading the love of reading and getting students interested in books is one of the parts of my job that I am most passionate about. A book tasting, not an original idea, but one that is widely written about on various literacy blogs and websites, has been an effective way to help students learn about books that interest them and motivate them to try out new titles, authors, and genres. 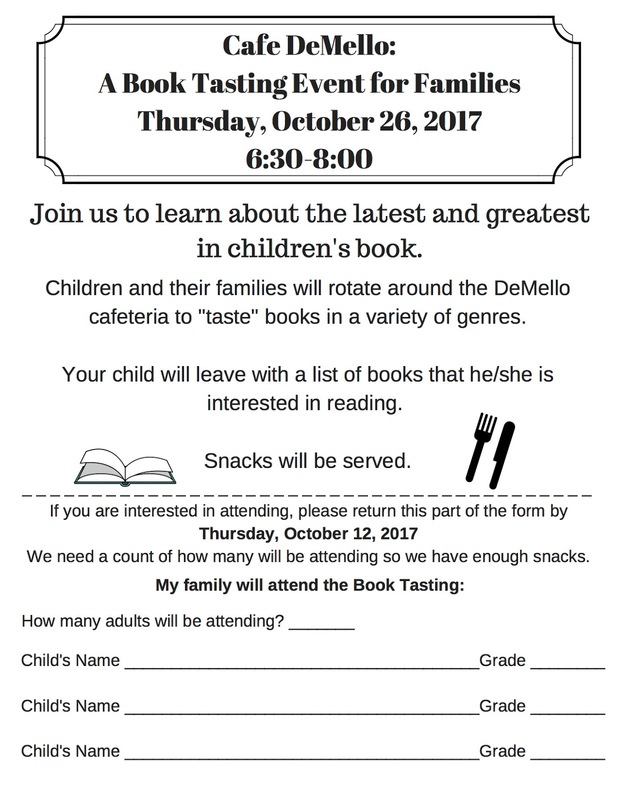 For the first time, I hosted a literacy night at my school based on the idea of a book tasting. Watching students interact with their families as they "sampled" books and listening to them talk about books they may like to read was a joy. To a literacy specialist, there is nothing better than witnessing this excitement about reading. Before students returned to school at night with their families, the school cafeteria was set up to resemble a restaurant. Five tables were covered in red and white checkered tablecloths and set up with battery-operated candles and platters of books. Each table was designated for one of the following genres or types of books: realistic fiction, fantasy, adventure, mystery, and graphic novels. 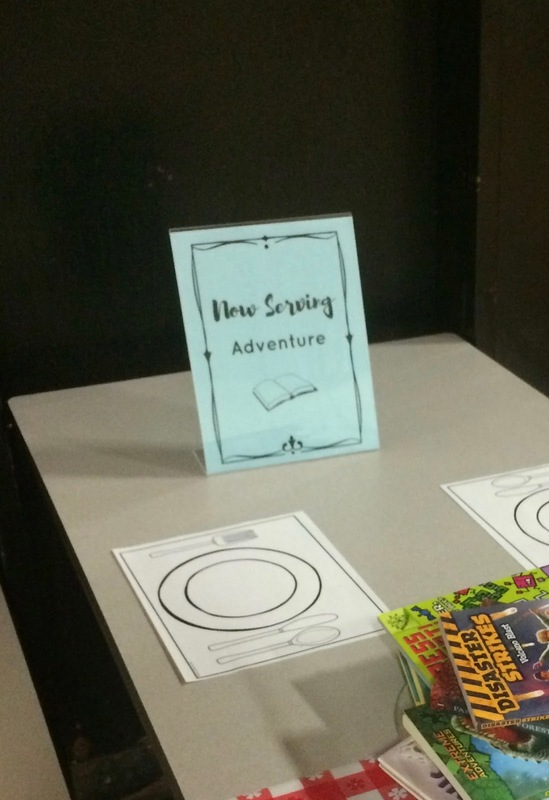 A "Now Serving" sign, stating the book genre for the table, was placed on each of the five tables. As families entered the cafeteria, Italian dinner music played and a virtual "fire" crackled on the projector screen. Students were given a "menu" which served as a place for them to record book titles they were interested in reading, a raffle ticket for the opportunity to win one of three book prizes, and a bracelet with the words "I Love to Read". 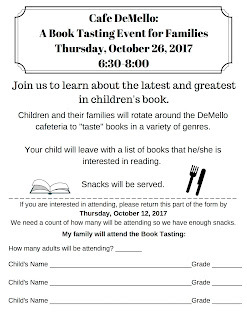 Parents were given a handout with ways to encourage reading at home. For the first fifteen minutes, students visited the raffle table and a table where they could help themselves to bookmarks, stickers, and pins related to various books and reading. Many of the freebies available were provided by generous children's authors who I reached out to through Twitter. Students enjoyed cookies and juice that were donated by local supermarkets. When families finished their snacks, I spoke briefly about the importance of reading and letting students choose what they want to read. I played this Dav Pilkey video in which he shares research about reading for fun. Then I explained the book tasting to families. I told them that similar to food, you don't know if you are going to like a book until you "sample" it. I also explained that sampling a book is like sampling food, meaning that you read only a little bit, such as the description on the back or the first page or two. "I Love to Read" pencils were passed out to each student and the book tasting began. 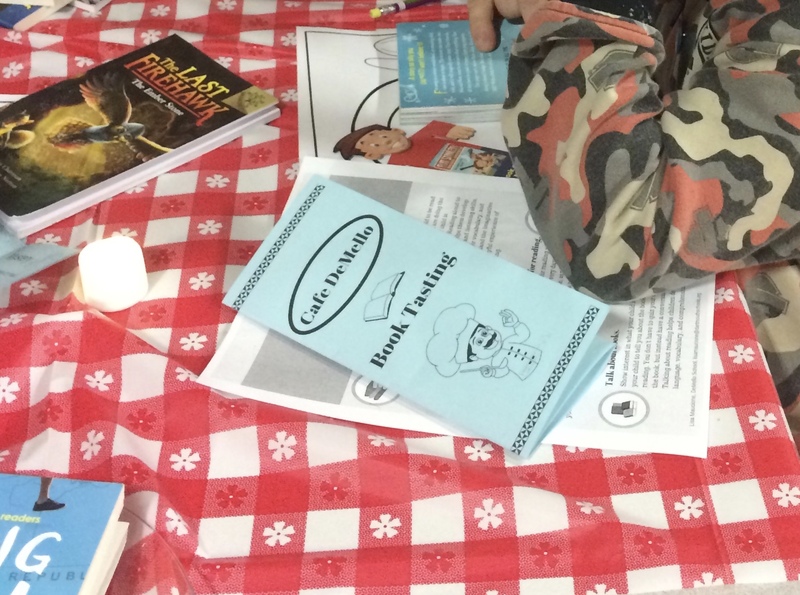 For about eight minutes, families "sampled" the books at the table where they sat. Students jotted down titles of books on the "menu" they were given when they arrived. There were a variety of levels of books on the tables, from picture books to early readers to chapter books, for families to peruse. When the designated time was up, families moved to the next table. Families had the opportunity to visit all of the tables. In between table rotations, two students told a book-related joke. 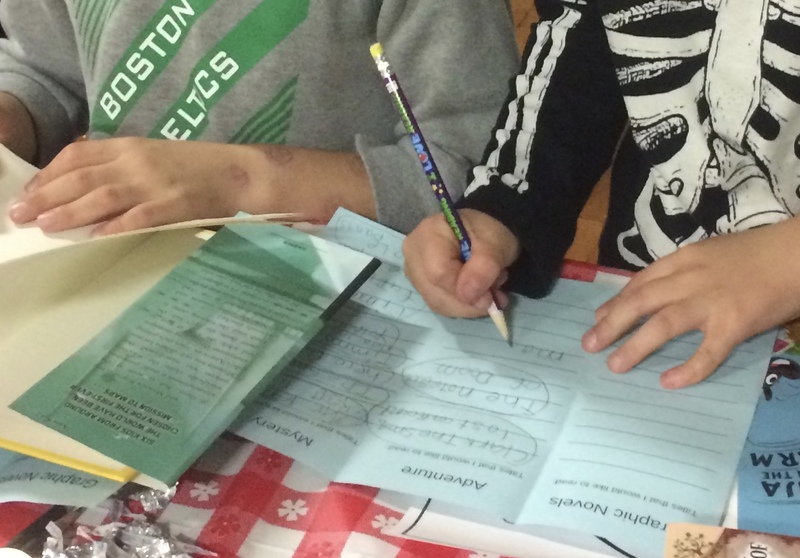 After families visited all the tables, raffle winners were chosen and students had the opportunity to sign-out any of the books they were interested in borrowing to read. I think families left for the night feeling excited about books and reading. Some of the books at the "Mystery" table. The planning for this night involved gathering books to place at each of the tables. I chose mostly recently published titles. Being a reader of children's literature, these were books I know and love. I also made sure to include those books that tend to be popular among students. I purchased the books through a grant from an organization I am a member of, the Southeast Regional Reading Council, a local council of the Massachusetts Reading Association. With this grant, I was also able to purchase some of the supplies needed for the night. Thanks to SERRC, the generosity of children's authors, local supermarkets, and the teachers who assisted me with the event, the first family book tasting event at my school was a success. This is so amazing -- how lucky these students are to have you in their lives. Thank you for sharing -- I'm sure your post will inspire others to create this type of night in their school as well. What a great event and thank you for all the sharing details. I am looking to change up our family literacy night and may use this idea. I might have to reach back to you about this. Sounds like such a great evening for the families! I wonder if we could incorporate some of these ideas at an upcoming parent share. Our librarian and kindergarten teacher are teaming up to do this with students monthly. It was wonderful! I love the idea of doing it in the evening for parents. Thanks for this idea. This is an awesome idea, Lisa. I know you and others worked hard to create such an exciting night for the families and students. Congratulations! What a wonderful evening for families! Thanks for the inspiration.